Congratulations on your new Lil' Viking! Have you had an addition to your family within the last 6 months? We want to know! 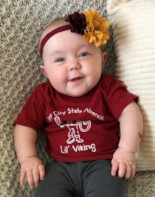 After you have received your baby's Lil' Viking t-shirt, send us your baby's photo so we can include it in the next issue of our alumni Bulletin. Email the photo to kim.hesch@vcsu.edu.